Huge Savings Item! 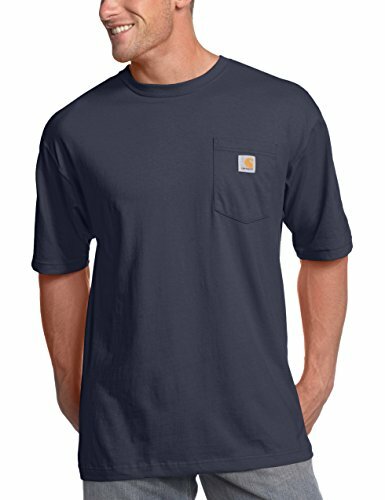 Save 16% on the Carhartt Men's Big & Tall Workwear Pocket Short Sleeve T-Shirt Original Fit K87,Bluestone,X-Large Tall by Carhartt at Mas Fashion. MPN: K87-BLS. Hurry! Limited time offer. Offer valid only while supplies last. Carhartt's short sleeve work wear pocket t-shirt is an all-purpose work shirt that is perfect in warm weather or for layering when it gets cold. Carhartt's short sleeve work wear pocket t-shirt is an all-purpose work shirt that is perfect in warm weather or for layering when it gets cold. it’s made of 6.75-ounce, 100% cotton jersey knit and features a rib-knit collar and a left chest pocket. it's also been designed with side-seamed construction to minimize twisting and maximize comfort. ash fiber content is 99% cotton / 1% polyester. heather gray fiber content is 90% cotton / 10% polyester.